Play with colour. Play with light, play with texture. INC.redible by NAILS.INC comes through with the hottest shades and makeup products that both fun and super effective. Not just a pretty face, INC.redible products are full of nourishing, natural ingredients. Even better, INC.credible is totally cruelty free, to help keep our fluffy friends safe. Not settling just for innovation, INC.redible is here to start trends. Not content to just play it safe, Nails Inc’s founder Thea Green wanted to create makeup products that makes it possible to challenge your comfort zone, with shades and textures that will delight you in how easily you can pull them off. With an inclusive perspective, INC.redible makeup is made for all skin tones and skin shades. No more longing scrolls through your social media; it’s easy to find a beautiful shade that will suit you. Want something that will speak volumes? Looking for a wearable, everyday look? Don’t settle for anything less than INC.redible. What are the products that everyone is talking about from INC.redible? Get your hands on something that keeps selling out. INC.redible were making glass skin effects possible way before it even had a name. 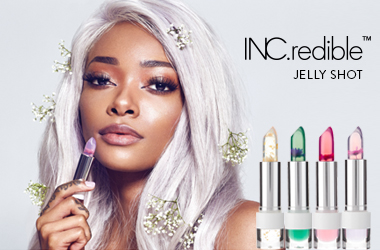 INC.redible You Glow Girl Iridescent Jelly Highlighter is a melting gel texture highlighter for all over the face. This gorgeous highlighter can be built up from a ‘woke up like this’ healthy sheen, to a glamorous editorial look. Tired of glosses that move around, or even worse, that don’t even hydrate? INC.redible Glazin’ Over Long Lasting Intense Colour Gloss offers full coverage that goes on evenly and easily. Ultra-comfy throughout the day, and so hydrating you wont need a balm, this is a gloss that will change your mind about lip gloss. Lip balm doesn’t have to be boring. With a unique flower detail and shaped like a lipstick, INC.redible Jelly Shot Superfood Lip Quenchers are enriched with Rice Bran Oil and Avocado Oil, which naturally protect and hydrate the lips. This matte lipstick is really smooth and creamy! It dries down to a comfortable matte finish but doesn&apos;t stick to dry bits. I have the peachy/ gold shade. While I do like the hydration and smoothness of the balm, I don&apos;t enjoy the shimmeriness of it. I prefer a more natural look, but I think this might be a good way to test out metallic lips without committing to a full glittery look. I love this product!! It’s really nice and moisturising but it looks so awesome and is whenever I pull it out everyone asks what it is. I will definitely continue to purchase it!